Prop Store’s current Vintage Toys And Collectibles Live Auction represents another ground-breaking first for the company. 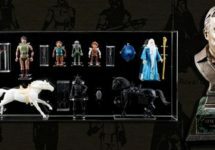 In bringing together 750 original production toys, international collectibles, posters, cast & crew items into one auction, it is the first time Prop Store has moved into the toy collecting space with a carefully curated selection from some of the world’s most beloved movies: Indiana Jones, Star Trek, The Lord of the Rings, Jurassic Park, Marvel, Teenage Mutant Ninja Turtles, Rambo and of course Star Wars. Each of us falls in love with the playthings we encounter as children, many of them still treasured as we grow up and out of touch with our sense of play. But sometimes we give our toys away, or lose them, or sell them to make space – and immediately after, we regret it. Now, Prop Store is returning those lost collectibles to avid and amateur collectors alike with its latest auction: a cornucopia of vintage figures, trading cards, vehicles, proof sheets, and more pieces from every stage of toy production. 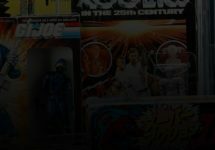 Whether you prefer Star Wars or Buck Rogers, Topps or Mego, our 2019 Vintage Toys & Collectibles Live Auction offers selections from across the world of collecting. Here are just a few highlight examples from the auction.